Games of Mystery is pleased to announce the availability of a new mystery casual game from Big Fish Games released today and available to BFG Club members. You can find out more about these games by visiting our Mystery Games: Big Fish Download Games page or by clicking on the links provided below. A rash of murders has struck, and it’s up to you as an FBI agent to find the murderer in this dark and spooky hidden object game! Explore an eerie mansion and find clues and the motive behind the murders. As you dive deeper in the case, you realize that you’re more connected to the murders than you ever would have imagined. 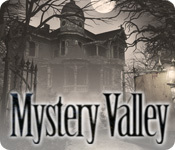 Mystery Valley may be downloaded and purchased for $6.99 with a Big Fish Game Club membership. A demonstration version (141.22 MB) may be downloaded and played for free for one hour. Read Ms. Terri's reviews of the adventure and casual mystery games featured on this site, including Midnight Mysteries: The Edgar Allan Poe Conspiracy, Nancy Drew Dossier: Lights, Camera, Curses!, Enlightenus, and many more! Games of Mystery is your source for mystery-themed video, electronic, and board games, parties for kids and adults, and murder mystery weekends and mystery getaway vacations!